Fascinating. I have been arguing for 10 years that placebo effect can be useful and we need to understand it better, and you have turned that upside down. Well done. The realisation that placebo effects are so small removes the last (very flimsy) plank from the arguments of those selling alternative medicine. And it’s also a blow for pharma companies who sell things that are near-ineffective. Recently, Medscape France ran a series of articles, which I didn’t read in detail because it isn’t my subject (see for example http://francais.medscape.com/voirarticle/3601836?nlid=90543_2401). To summarise briefly, it’s been proposed that the placebo effect works when there exists an endogenous ligand for the drug (agonist or antagonist), such as a receptor. The right bedside manner sets things off. I read elsewhere that you can get a placebo effect even in patients who have been informed that that’s what they’re getting, as long as it’s done properly. A long time ago, former psychiatrist colleagues were convinced that lithium (for certain periodic disorders) and antidepressants are remarkably effective and are essential for success, but *only* if the doctor and other carers have a lot of time to spend with the patients. All that may be too subtle for those who make the rules and regulations of clinical trials. Only this morning (perhaps it was yesterday) I heard on the wireless a discussion of the relative merits and costs (it *was* in the UK) of “talking” vs pharmacological treatment for depression, with great emphasis on the respective waiting lists. From my second-hand experience, the only thing reasonably sure to work is a combination of the two treatments, though it would be better to do without the traditional waiting lists. I’m not doubting that genuine placebo responses exist, and can be measured in experiments that are designed to find them. But the empirical evidence suggests that they provide little or no benefit to real patients. That being the case, their possible mechanisms (endorphins etc) are not only speculative, but are also of little interest. The main reason why people appear to respond to dummy pills (or to no treatment at all) is nothing to do with placebo responses: it is a statistical artefact. The principle has been understood for over 100 years, so it isn’t obvious to me why it isn’t better understood. I guess one reason is that understanding it may well reduce the income of both big pharma, and of the legions of quacks, who are eager to sell us things that don’t work. I was a drug addict for many years in a country where good drugs were quite scarce. People were always trying to sell me placebos. It was obvious that they didn’t work, that there was a small measure of gullibility available for a short time with regard to extremely minor subjective phenomena but no real placebo effect. I can think of another reason why placebo control arms need to be included in RCTs besides regression to the mean and any putative placebo effect. Participants in trials are subjected to conditions that have real physiological effects. These include fasting for blood draws, the loss of blood in testing, white coat syndrome, even the response to meeting an attractive phlebotomist regularly. The idea that a particular type of behaviour is required of someone in an experiment could also produce significant effects (e.g. when testing a drug that interacts with alcohol, those on the placebo would be given the same advice about avoiding alcohol; but there is also likely to be a more general sense of responsibility among people in RCTs). Therefore, the closer the terms of the experiment are for the two arms, the better, and this includes taking phoney pills, if only as a marker of compliance. If the pills are to be taken with food (or not) at a certain time of day, this introduces another potential physiological modifier. All these effects are likely to be minor, but may still be greater than any true placebo effect. How could you do that analysis in advance, without the data the trial will produce? Can you give a concrete example? The idea is that some measurement that predicts responsiveness can be made before the trial. A classical example is that it’s know that measurements of plasma cholinesterase predicts the response to the muscle relaxant, suxamethonium (the action of which is terminated by the cholinesterase enzyme). The choice of whether or not to treat breast cancer with things like tamoxifen is based on measurements of the amount of oestrogen receptor, before treatment starts (eg see https://en.wikipedia.org/wiki/Breast_cancer_management ). There has been a great deal of hype about personalised medicine, based on your DNA sequence (genome), though the complexities of genetics have meant that success, so far has been limited (eg see Caulfield, 2015). It’s coming, albeit more slowly that one hoped. There are huge statistical problems in identifying non-responders after the trial. In particular, there is no guarantee that, if tested again, they would still be a non-responder. This is dealt with nicely in Senn (2009). 1. I understand how this shows that most reported placebo effects are not as strong as they seem, due to the fact that they do not account for the ‘get-better-anyway’ effect. However, I do not understand how this shows/quantifies the actual size of the ‘placebo’ effect and suggests that it is small? 2. 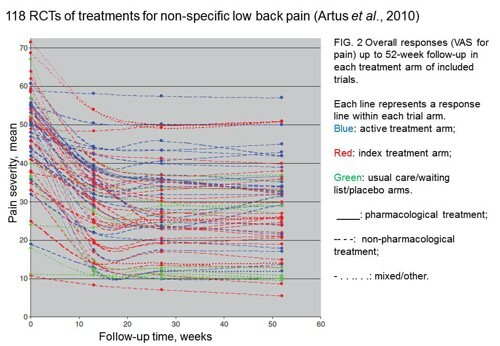 The example given in Figure 2 regarding back pain states that “if these patients had gone for treatment at the peak of their pain, then a while later they would feel better” . Isn’t this effect also counterbalanced by the fact that regression to the mean occurs the other way. I.e. some individuals will also taken part in trials during a ‘trough’ and hence seem to get worse following treatment. 3. How can regression to the mean account for placebo effects in studies entirely composed of healthy controls. For example, I recall a pain thresholding experiment showing that participants given dummy placebo exhibit higher pain thresholds than individuals given nothing. (1) As I pointed out near the start, the best way to measure the real (useful) placebo effect is to compare groups who are given a placebo and groups who have no treatment at all. In most cases the difference is quite small, even when the comparison isn’t blind (so it can only overestimate the genuine placebo effect). (2) Yes of course the effect can work in either direction. But not many people go for treatment when they are not suffering pain. Also, subscribed to your youtube channel.! Thanks for your comment. It’s true that analysis of covariance (ANCOVA) is another way to make some allowance for regression to the mean. But it makes assumptions about linear relationship between response and time which may well not be justified. It’s better, in general, to have a parallel control group which should show the same regression to the mean as the test group. The paper that you mention (Vickers & Altman, 2001) inadvertently provides a rather good example. It looks at acupuncture, which was fashionable in 2001, but which is now well-established to be no more than a myth. 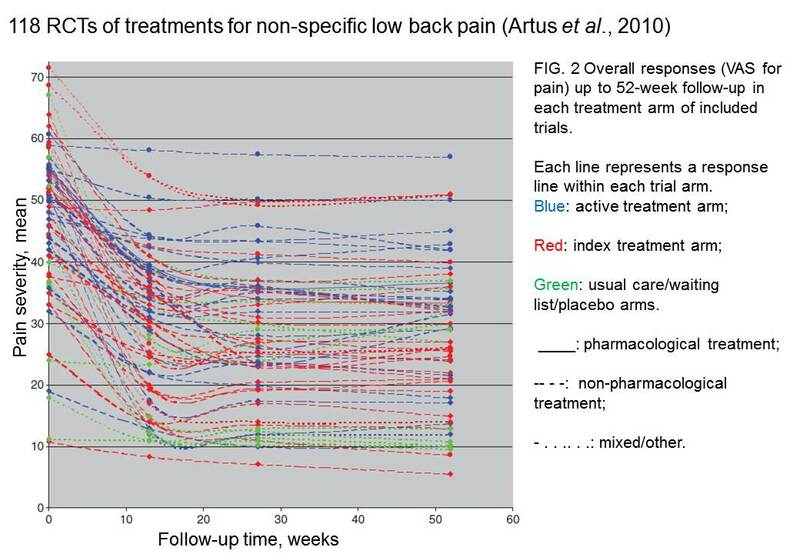 Yet the ANCOVA analysis decreases the P value this giving the impression that it works for shoulder pain. A classical false positive. If the average treatment effect is zero then claiming that there is a subset for whom the treatment effect is positive also amounts to claiming that there is another subset for whom the treatment effect is negative (for whom the treatment is harmful). Without the latter the average effect could not be zero. The U.S. mathematical psychologist Robyn Dawes called not seeing this “the subset fallacy” in his book Everyday Irrationality (2001, ch.6). should always do subgroup analysis and never believe the results”. Thanks for those excellent quotations. Of course you are quite right about the zero effect. I’ve fixed that now. Thank you. As I said, regression to the mean has been known for so long that it’s amazing that one still needs to write about it. The problem, I suppose, is that it is not in the interests of quacks to think about it. It’s also not in the interests of anyone who is being pressured to produce positive results. I find this post very compelling. How about the effects of meta-analyses on RCTs? I would suspect that meta-analyses would cover RCTs with from-each-other different “baseline-populations”, i.e, patients in individual RCTs are likely to start off from a specific baseline, however, it unlikely that a group of RCTs would start with patients with the same baseline. 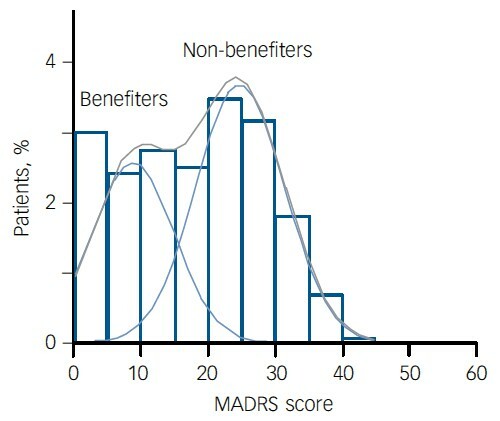 It would seem more probable that some RCTs would have “populations” starting from a high baseline, and some RCTs with a low baseline, and some RCTs with “median” baseline. That taken into account would diminsh the effects os “regression-to-the-mean”, would it not? Well RCTs are normally run with test and control groups in parallel, so, in principle both groups should experience the same regression to the mean, The problem arises largely in trials that look at difference from baseline. But of course it is a weakness of meta-analysis that you have to choose which trials to exclude. *Placebo has nothing to do with ineffective pill taking but with the environment a therapy is administred. When judging placebo effects from RCT studies the danger arises that the intrinsic placebo (psychophysioloical effect) will be rather low because in many RCT studies the environmental effect is often targeted at minimising placebo. Indeed most medical companies who launch a new medication will have to compare it to placebo hence are strategically inclined to lower the placebo effect in order to make the statistical gap (they say “significance”) with their “effective” product as large as possible. I have seen studies where they even pre-select good placeboresponders and exclude them from the final study (selection bias). Therefore we must be cautious of this bias when judging placebo from RCT studies alone. How can we explain what i use to denominate as the “placebo plus” effect. It was a study in Nature review neurosciences by Fabrizio Benedetti et al (http://www.nature.com/nrn/journal/v6/n7/full/nrn1705.html) where in an RCT study a supposed pain killer ( proglumide an cholecystokinine antagonist) was compared to placebo (same environmental context of administration) and gave a consistent statistical improvement over placebo. However when an assistant administered the product without knowledge of the patient , the proglumide did nothing at all. So here we are confronted with a product in itself totally inactive (hence placebo-like) that works better then placebo in strictly controlled RCT testing as long as the patient – and this is dubbel blind- is aware of it being adninistrated. I call it placebo plus and the article explains the causal effect. The study by Colloca and Benedetti (2005) [download pdf] was aware of regression to the mean (see Box 1) and it refers to an earlier version (Hróbjartsson & Gøtzsche, 2005) of the study to which I refer, namely Hróbjartsson & Gøtzsche (2010). It also acknowledges that the only way to distinguish between a genuine placebo effect and regression to the mean is to compare placebo with no-treatment. When this is done, it’s found that there is often (though not always) a difference, but that this difference, the genuine placebo effect) is too small to be useful to patients. I don’t deny for a moment that real placebo effects exist, but in seems that, in real clinical settings, they usually aren’t big enough to be useful, and that the greatest part of difference between drug and placebo is accounted for be regression to the mean. *My favourite is in Danny Kahneman’s autobiography – the story about “regression to the mean explaining why rebukes can seem to improve performance, while praise seems to backfire” in the performance of Israeli flight instructors. Sorry to be late to the party! IMHO much of this discussion fails to distinguish what the ‘effects’ are, or are supposed to be. Is the ‘work’ to which DC refers in the title of this thread ‘work’ on the body – ‘to have an effect on a specific disease, condition or ailment’ ? If so, then (by definition) placebos have no effect greater than…placebos. But if ‘ to help the patient come to terms with their condition, feel better about it, have a degree of hope, consolation, solace and charitable love’ – then many patients do indeed find the experience of being treated by a camist (one who uses CAMs) – beneficial. For them, ‘it works’. Patients who decide to use camistry will have their response expectancies enhanced by the more theatrical placebos (to quote an eminent authority on such matters) – the pins, pushing, plants, pillules in a therapeutic environment with an apparently empathic practitioner all deepen the auto-hypnotic experience for these believers – and they go away ‘happy’. Up to a point, and for a time. As do those believers who go to church. It’s called TLC. More in ‘Real Secrets of Alternative Medicine (Amazon)! I’m not denying that some people feel better after CAM treatment, but it seems that they main reason for that is that they’d have felt better even if they hadn’t had the treatment. The evidence that I cite suggests that the placebo, theatrical or otherwise, has quite small psychological effects. The quotation from Peter Medawar hits the nail on the head. Of course that isn’t a reason to refrain from giving sick people some TLC while nature takes its course. I think this is really interesting, but I would be extremely careful how I worded it. If one discounts placebo as unimportant, then there’s a natural inclination to accept RCTs that ignore placebo (and blinding as well). I mean, if no-treatment arms are good enough, we can save a lot of money! We can look at a lot more treatments! Look at all these treatments we ignored because we compared them to placebo instead of to no-treatment! If we aren’t extremely rigorous with this, we’ll end up discounting placebo entirely. Would Moseley’s famous paper ever be published in this environment? Or would we still be operating and failing to beat placebo? To be sure, I don’t think that placebo is going to do anything for objective measures of something like renal failure. But we have to keep in mind that even when we treat objective measures, we are doing so in service to subjective measures. We don’t treat disease because disease is inherently bad; we treat it because it causes pain, fatigue, unhappiness. Even when we’re trying to save life or limb, we’re doing so according to our patients’ wishes, wishes made without consciousness of lab values or imaging, made with consciousness only of unquantifiable pain, fear, and hope. With this understanding, it’s clear that the effect of placebo on objective measures is irrelevant. All of our objective measures are merely proxies for future, subjective measures. The point of having a control group is that regression to the mean will distort the results to the same extent (on average) in the control and intervention groups. If you discount placebo as too small to worry about, you still need a control group to assess regression to the mean, but that control group need not be treated with placebo. A no-treatment control can measure regression to the mean as well as a placebo control. As explained at the start of this post, treatment vs placebo measures placebo effect + regression to the mean. To measure the genuine placebo effect you have to compare placebo vs no-treatment. Yes. Exactly. I’m sorry that I’m not expressing my point clearly. If you compare no-treatment to placebo arms and come to the conclusion that there is no difference– that is, that the entirety is regression to the mean– then it would irresponsible to waste resources on a placebo control when a much cheaper no-treatment control would measure the exact same thing. Neither I, nor Hróbjartsson & Gøtzsche (2010), said that placebo effects are non-existent: quite on the contrary. We said merely that, on average, they are too small to give noticeable relief to patients. That doesn’t mean that they can be ignored in a properly-conducted trial. Regarding your “Statistical postscript”: In my understanding, it is a misinterpretation to use p-values like you do: as a measure of strength of evidence. As far as I know, for such claims you need Bayesian stats; that also lets you take into account the prior plausibility of the effect. If you had followed the link in the statistical postscript, you would have seen that that’s exactly what I said. I’ve recent;y posted a sequel paper, The Reproducibility Of Research And The Misinterpretation Of P Values, which deals with these questions in greater detail. I also propose some solutions, e.g. to cite minimum false positive rates, and to use the reverse Bayesian argument to give the prior thqt would be needed to produce an acceptable false positive rate. One thing which seems to be missing from this discussion is the ability to help people. It seems to me (and I would love to be corrected / pointed in the right direction) that these studies try to narrow down the definition of placebo as much as possible so that they can show “you see, placebo does not work”. I still argue that there is a value to administering the placebo – it gives much more tangible hope to the patient than just saying “you’ll get better” and reduces their anxiety. I would love to see some studies which look at this. Again, I’m just worried that we’re loosing sight of the mission (helping people) just because we want to be “perfectly rational”.